The crossover SUVs are the best-sellers in industry and brand’s give them a priority. Hyundai is no exception. The all-new Kona arrived recently and the Santa Fe has also arrived fully redesigned. The popular Tucson also received a major refresh. 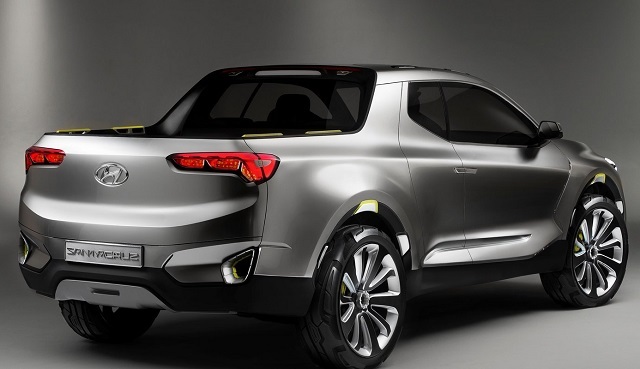 But this brand also hinted the arrival of the lifestyle pickup truck with the Hyundai Santa Cruz Concept. This model was shown at the 2015 Detroit auto Show to feel the pulse of the buyers and about a year after the information came from Hyundai that this model has got the green light for the production. However, Hyundai hasn’t yet been caught testing the prototype of this truck. There are no details about the production design and specs either. 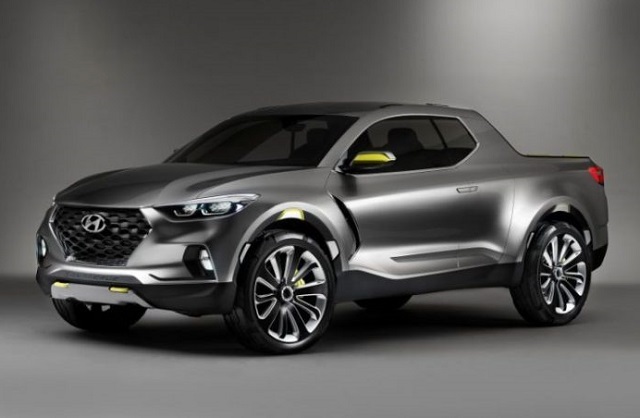 Some sources claim that Hyundai’s truck will join the lineup as the 2019 Hyundai Santa Cruz. It has also been expected that Hyundai will go with the uni-body design like the well-received Honda Ridgeline. The model was also reported to use the Tucson crossover as the base. The 2019 Hyundai Santa Cruz is expected to join the pickup truck market as another crossover SUV-based version alongside the Pilot SUV-derived Honda Ridgeline. In that context, the Santa Cruz pickup should use the platform of the recently refreshed Tucson crossover. The uni-body design would provide almost car-like handling and driving dynamics unmatched by the body-on-frame trucks. Styling wise, it is expected to come with the combined the design of the Santa Cruz concept and recently restyled SUVs. The model will surely get the full four-door cab instead of the half rear doors on the concept model. The front should include brand’s cascading grille design like the latest SUVs and similar headlights. The Hyundai Truck will also integrate the mid-size cargo bed and we don’t know would Hyundai use the bed extension mechanism like on the concept model. Inside the cabin, the Santa Cruz truck is also expected to adopt the design similar to the recent SUVs. That means the dash with the floating center touchscreen inserted of brand’s previous horizontal oriented setup. The center screen will run the latest infotainment system and the truck will also include the suite of active safety systems. Like the refreshed SUVs, the truck will be safer thanks to the systems like the adaptive cruise control, adaptive headlights, lane control, blind-spot monitoring, etc. When it comes to the power units, it is still unconfirmed what the 2019 Hyundai Santa Cruz will have under the hood. Hyundai presented the concept version with the 2.0-liter turbodiesel four-cylinder engine. This unit was rated at 190 hp and 300 pound-feet of torque. On the other hand, Hyundai introduced the new Santa FE SUV with the new turbodiesel engine. This three-row SUV uses a 2.2-liter turbodiesel-4 which matches the number of ponies from the concept but improved the torque to 322 pound-feet of torque. The engine works in the combination with the 8-speed transmission and this combo could easily be adapted to the truck version. The Santa Cruz truck could also use a naturally aspirated 2.4-liter four-cylinder engine option from Hyundai’s part bin. The 2.0-liter turbocharged engine with power around 240 hp is also the possibility. Hyundai will offer both the two- and four-wheel drive options and we hope for the off-road focused version. No confirmation of the launch date of the 2019 Hyundai Santa Cruz yet. The model is expected by the end of this year. The price should take the position between mid-20, 000 and $30k. When will it be available in the uk ? if it looks like the concept picture i will buy one. That is SHARP!!! !